At the end of winter, it’s still the big fat stalks that take longer to cook and are more fibrous than their skinnier counterparts. And then, the day comes where the asparagus display is full of thin, skinny, little stalks and the price drops and bundles of them appear in my cart. 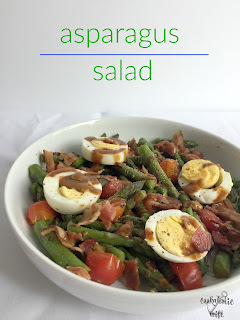 For years I hated asparagus and then one day the taste buds changed and it became one of my favorite vegetables. Roasted, sauteed, grilled, baked, covered in cheese, it doesn’t matter how you serve it, if there is asparagus I’m coming to eat it. 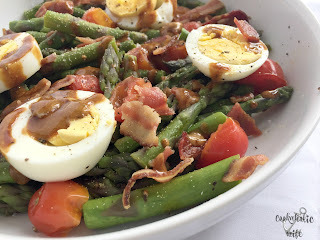 I don’t typically think of asparagus and salad together, but back in my Whole30 days, I made a recipe that treated the asparagus like the lettuce in a BLT, just in a salad form and from then on I was hooked on asparagus in salads. 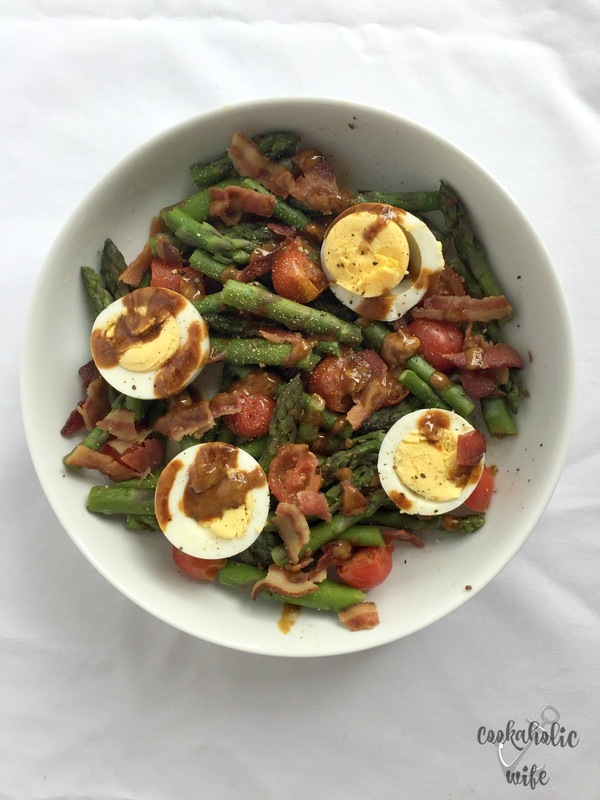 This salad can be made for breakfast, lunch or even as a side dish as it’s full of fresh asparagus, hard-boiled eggs and bacon. 1. Add the chicken or vegetable broth to a saucepan over medium heat. 2. Add the asparagus pieces and cook for 2-3 minutes or until just tender-crisp. 3. Add in the cherry tomatoes and cook for 1 minute more, stirring as needed. 4. Drain the liquid from the saucepan and transfer asparagus and cherry tomatoes to a bowl. 5. Top with sliced hard boiled eggs and crumbled bacon. 6. Prepare the dressing by whisking together the dijon mustard and tamari until thin enough to be poured over the salad. Season to taste with salt and pepper, careful of salt as tamari is very salty. 7. Salad can be eaten warm or refrigerated and eaten chilled. Fast Metabolism Diet: to be P2 compliant, omit cherry tomatoes and egg whites. For P3, vegetables may be cooked in oil or another healthy fat may be added. Portions for turkey bacon and eggs may need to adjusted based off weight loss goals. I went with a similar route this time by adding bacon and egg to the salad, but instead of cooking the asparagus and cherry tomatoes in oil or using an oil based dressing I opted for simmer in broth and a mustard based dressing. 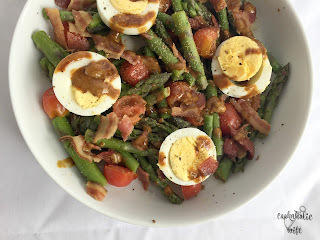 I nearly forgot to photograph this salad because as soon as I finished making it, I took a bite, then another, then another and then I needed to artfully arrange the asparagus in the bowl to look like ther was more than what was actually in there. Michigan Asparagus, one of our sponsors, wanted to provide us with asparagus to use, but we’re not quite into the season yet. Instead they sent us gift cards, which I used to purchase the asparagus and turkey bacon for this recipe. This looks absolutely fantastic! I am making this one for sure! I love asparagus salads and this one sounds particularly delicious.